Even had he never deigned to become a director, Barbet Schroeder would be a towering figure in cinema. As a young man in the early 1960s, he co-founded, with his friend Eric Rohmer, a production company called Les Films du Losange, which produced some of the greatest French films of the second half of the 20th century. Or all of the 20th century, honestly. I think “of all time” might apply. His personal producer credit has been attached to masterpieces such as Rohmer’s “The Marquise of O,” Fassbinder’s “Chinese Roulette,” Rivette’s “Celine and Julie Go Boating” (in which the dashingly handsome Schroeder also appears as an actor)—those three in a mere two-year span between 1974 and 1976. So yeah, he’s a hero of film even without his directorial filmography. Which by my lights is pretty heroic, and often underrated. He began his directing career with 1969’s “More,” a vivid, unsparing fictional portrait of a hippie couple whose dreams of a utopian life in Ibiza wither pretty quickly under the weight of heroin addiction. He continued, toggling between fiction and documentary and revealing an interest in perverse/overstepping states of being that verged on the anthropological if not sociological. His 1974 documentary on the murderous African dictator, named after its subject, “General Idi Amin Dada,” showed that Schroeder was a lot more than an outsider looking in. Yes, he used a bit of trickery to get close to his subject, offering him the chance to make an “autoportrait,” but Schroeder also put himself in harm’s way with his subterfuge. Once his directing career moved to Hollywood, his studies in human perversity, which include pictures like “Barfly” and “Reversal of Fortune,” made him one of the most interesting European directors working here. By my lights even his less successful efforts, such as “Murder by Numbers,” have a certain undercurrent of danger that gives them intrigue. 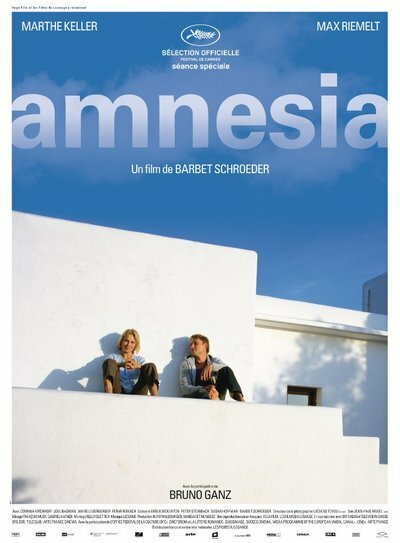 His latest fictional film, “Amnesia,” finds him back in Ibiza, but the prevailing tone as the movie opens is placid, almost contemplative. Marthe Keller, 70 at the time of the movie’s making, comes into a sumptuous sunset walking with a cane, looking substantially older. And the movie immediately hopscotches back in time, to a decade-plus prior. Keller’s character, named Martha, is speaking English to a man who’s speaking German to her, pestering her about a property in Germany whose sale she is required to supervise in person, in that country. She’s not having it. A self-imposed exile from her country, she now lives on Ibiza, the island on which Schroeder directed his first movie. We learn that she refuses to speak German, to drink German wine, or even to ride in a German car. Nazism compelled her to renounce all things German. Not that, for the most part, she makes a big deal of it. Her island life is simple. She lives in a beautiful house with a beautiful view that has no electricity. Off the grid, she has a pleasant social life with longtime neighbors. But a new neighbor has recently moved in. Jo Gellert, a musician who calls himself DJ Gello, is settling in Ibiza to make a name in electronic dance music—the island is (still) a well-known vacation/party spot attracting a lot of trendy revelers. Jo, played by Max Riemelt, is good-looking, friendly, open-minded and openhearted. He’s also German. He and Martha take an immediate, almost electric liking to each other. Keller’s portrayal of her character’s flirty, light side is very disarming; you can see why Jo falls for Martha, and hard. The performers’ chemistry helps the movie roll over some of its more on-the-nose dialogue. When Martha explains her antipathy towards Germany to him, he pushes back slightly, but he comes to find her conviction admirable. As does the viewer. For the first hour, the movie blends a pleasant story of Platonic love with more disquieting themes of history and memory. (Speaking of on-the-nose, the club where DJ Gello hopes to make his splash is itself called “Amnesia.” Forgivable in light of the fact that it is the real name of a the real Ibiza club featured.) Things get more fraught when Jo gets a visit from his physician mother (Corinna Kirchoff), who wants to convince Jo to return to Germany to be part of the changes in the now no-longer-divided country. Mom brings with her Jo’s beloved grandfather, played by Bruno Ganz. And Ganz’s character, also named Bruno, has a secret from the war years, one that Martha icily draws out of him. Schroeder’s film style has always been foursquare and straightforward, but he’s capable of some striking effects within his planispokenness. One of the movie’s most striking moments finds Bruno standing on the patio of Jo’s house, having come to a critical juncture in a war story he’s telling. Martha, from inside the house, asks, “What happened to the girls?” and her disembodied voice at that point seems like that of Bruno’s conscience. The writing of this scene, though, and Ganz’s magnificent performance, also has the effect of making Martha’s stance and indignation look petty, imperious. It is reported that this movie’s scenario was inspired by the life of Schroeder’s own mother, and the film has a personal tone that is not always detectable in his other movies. It enhances a film that’s one of the most thoughtful in his body of work.